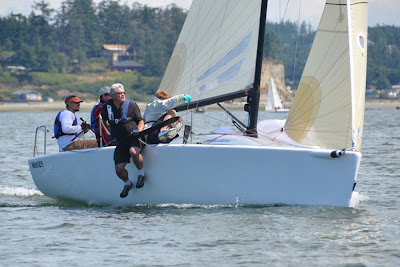 Each summer one of our traditions is to participate in the Whidbey Island Race Week. This event consists of 5 days of yacht racing in Penn Cove near Coupeville. Since we don't race our Melges 24 in many regatta's each year, we expected some tough competition and we were not to be disappointed. There were 13 boats registered in our division, several of which were just back from the 2011 World Championships. Needless to say we had four days of great racing and finished the week tied for second with pTeron (Dan Kaseler). Since they had one more bullet than we did we ended 3rd -- unfortunately we didn't get to sail the last day due to the lack of wind.